Updating packages list from the local repos. If everything is fine we will move to the default DocumentRoot Directory (which is /var/www/html). There we can then create the sub-directory /var/www/html/ubuntu and assign it to the appropriate owner, in this case www-data ( the user under which Apache HTTP runs ). It is strongly recommended that the DocumentRoot or at least the ubuntu subfolder is on a filesystem belonging to a logical volume; this way we can enlarge it online, with no downtime. At the time of my testing 171.5 GiB are the absolute minimum space needed if also mirroring the src packages; so to plan for the future it is recommended to have at least 300 GiB of disk space. 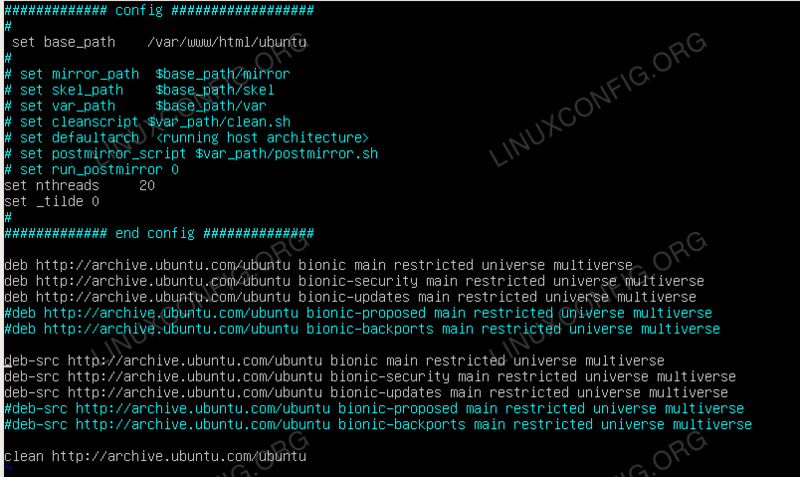 This is mainly an estimation if choosing one version of Ubuntu; if it is needed to mirror packages for different versions the space requirements will increase considerably. Selecting which repositories to mirror on the server.Once apt-mirror is installed we can make a backup copy of its configuration file /etc/apt/mirror.list, after that you make sure the line containing the option set base_pathpoints to the correct path for our repository (by default is /var/spool/apt-mirror ). So you can now use your favorite editor (vi or nano for instance) to change the base_path option in the mirror.list file to /var/www/html/ubuntu; you need also to specify you are mirroring the bionic distro (change accordingly if you have a different Ubuntu version) repos, always in the mirror.list configuration file. If you need to, you can interrupt this process ( with the classic CTRL+C combo ) and restart it later; it will resume from where was left. Eventually we will get to the point when the clean.sh and postmirror.sh scripts are executed, it is a sign the mirroring process has been completed. And save and exit (using vi, nano or whatever editor is set). It is recommended to comment any line in the /etc/apt/sources.list file referring to repositories not mirrored in our server, for instance, in this case, any line starting with deb-srcand containing bionic-backports have been commented. If you don’t do that you might get the error Release file has not been found when running the command apt update on the client. First of all we replace any string archive.ubuntu.com with our local mirror IP, in this case 10.0.0.42. Of course your local IP address could be different. For the purpose of this tutorial we are only mirroring packages or repositories from archive.ubuntu.com; of course you can add other unofficial repositories in the mirror.list file in the server, but then you have to re-run apt-mirror there and edit on any client the sources.list file accordingly. Setting up a local repository in Ubuntu is not difficult as it might seem and it can come handy provided you have adequate local network and disk resources.